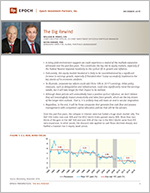 The Big Rewind - Epoch Investment Partners, Inc.
A rising yield environment suggests we could experience a rewind of the multiple expansion witnessed over the past five years. This constitutes the key risk to equity markets, especially if the Federal Reserve responds hawkishly to the cyclical lift in growth and inflation. Fortunately, this equity market headwind is likely to be counterbalanced by a significant increase in earnings growth, especially if President-elect Trump successfully implements the key planks of his economic platform. To illustrate, corporate tax reform could add 5% to 10% to 2017’s earnings. Other policy measures, such as deregulation and infrastructure, could also significantly move the earnings needle, but it will take longer for their impact to be realized. Although these policies will undoubtedly have a positive cyclical influence, we don’t believe they will meaningfully impact productivity and labor force growth, which are the key drivers of the longer-term outlook. That is, it is unlikely they will mean an end to secular stagnation. Regardless, in the end, it will be those companies that generate free cash flow and possess managements with competent capital allocation policies that will be the winners. Over the past five years, the collapse in interest rates has fueled a huge stock market rally. The S&P 500 Index rose over 90% and the MSCI World Index gained nearly 80%. More than two-thirds of the gain in the S&P 500 and over 85% of the rise in the MSCI World came from P/E ratio expansion. In other words, the discount rate applied to cash flows declined sharply and fuelled a massive rise in equity asset prices. Figure 1 shows a 34-year history of interest rates. The grey vertical bars indicate recession periods, the horizontal solid line is the average real 10-year bond rate for the period between economic contractions, and the wavy blue line reflects the monthly fluctuation of the real interest rate of the 10-year Treasury bond throughout the 34-year period ended November, 2016. Real rates first reached zero in 2012 and then touched that level again this year. Employment has steadily grown since 2009 and the unemployment rate reached multi-year lows in 2016. This portends a shift in the drivers of stock market returns. Trump’s unexpected election victory* triggered a massive shift in the yield curve as shown in Figure 2. The anticipation of a significant increase in fiscal spending combined with lower tax rates for both individuals and corporations caused sentiment to shift dramatically from “TINA” (There Is No Alternative) stock beneficiaries into cyclicals and financials. If rates have indeed bottomed, is it possible we will see the Big Rewind of stock market returns for the past five years? Future market gains would then be driven by changes in earnings and dividends rather than falling discount rates (and correspondingly higher P/E ratios). In Figure 3, we show two pie charts that reflect the individual contribution of each one of the three drivers of equity returns — earnings, dividends and P/E ratios — over the past five years. It seems logical to us that the discount rate applied to earnings and dividends will rise with an increase in bond yields. As a result, unless offset by gains in earnings and dividend growth, the stock market level faces a headwind from a higher discount rate. Importantly, it looks more risky for long duration equity assets (think growth stocks) than shorter duration ones (think value stocks). Indeed, if Trump’s policies are put into place, financial stocks and industrials should fare relatively well — particularly, domestic companies. However, the prospect of modest cyclical inflation and accelerating fiscal spending does not necessarily mean an end to secular stagnation. Secular stagnation became a near consensus view in 2016 and the lower-for-longer path of GDP growth and interest rates was embedded in portfolio positioning almost everywhere. Demography and productivity determine real GDP growth, and that number is unlikely to change much, particularly if Trump’s trade policies are put into place. Without a cooperative Congress on tax reform and fiscal spending, there is little reason to abandon the “two percent is the new four percent” forecast with respect to real GDP growth. Some tax reform, however, is likely and lower rates could indeed be retroactive to January, 2017. Some fiscal spending will occur but its effects may not be felt until 2018 and beyond. Momentum is magic at times and we guess that forecasters will be upping their estimates of economic growth in 2017 and beyond. But without tax reform and fiscal spending increases, real GDP growth is likely to remain low. Headline inflation, on the other hand, is likely to rise. The decline in oil prices pushed inflation rates down 100 bps or so over the past 18 months, but that will reverse itself shortly. Leading indicators are also rising and employment data is positive. Nevertheless, on a global basis core inflation remains below two percent. In Figure 4, we show inflation rates for the 35 OECD countries. Thirty countries are at 2% or less; 25 are below 1%; and 11 are negative. Only in the U.S. has core inflation begun to increase, and the key in the U.S. will be wages. If wages appreciate so will core inflation measures and the idea that the 10-year Treasury bond could reach 3% is not unreasonable. In short, it is unlikely that secular stagnation has ended, but we may have seen the lows for interest rates. Real rates in the U.S. have risen and thus the lows in the discount rate applied to corporate earnings and cash flows have likely bottomed. Where should one invest in a stock market in which P/E ratios are more likely to fall than rise will be an important question. Growth sector valuations will be impacted the most by rising discount rates whereas value sectors and finance in particular will become more attractive. In Figure 5, we show the best performing sectors for the last five years through October of this year, the first ten months of 2016, and the month of November. If rates rise and real growth accelerates modestly, we may well see the Big Rewind here as well. The sector rotation shown in Figure 5 reflects three policies that President-elect Trump has emphasized and that could have a significant cyclical impact. The first is corporate tax reform, which could add 5% to 10% to 2017’s earnings growth. (Each percentage point reduction in the effective tax rate increases S&P 500 EPS by $1.50 to $1.75.) Further, this reform would likely also include a repatriation tax holiday, and could result in $500 – $600 billion of cash repatriation by S&P 500 companies. Much of this would likely be used for buybacks and dividends. The evidence from the Homeland Investment Act of 2004 is that little was used to fund capital expenditures. Second, the new administration has promised an aggressive push for deregulation, especially in the energy and financial sectors. Both industries are highly complex, but competent and thoughtful deregulation could have significant impacts, including on the broader economy. For example, financial deregulation could allow credit growth to accelerate, which would spur on the economic machine. However, credit growth is already quite strong in most parts of the economy and debt imbalances remain worrisome, suggesting that opening up the cash spigots now could lead to problems in a few years. Finally, infrastructure spending is probably the hardest to evaluate given uncertainties about its magnitude and timing. Although desirable, given the crumbling state of U.S. infrastructure, it would have made much more sense before the economy’s output gap closed. A big ramp up now risks adding to wage and inflation pressures, and crowding out private sector activity. If these policies are successfully implemented it seems reasonable to ask, how long will the cycle remain positive? Alternatively, what could cause this move to short-circuit itself? The most likely candidate is the associated rise in bond yields, which could choke off real activity (the most interest-rate sensitive sectors are typically related to consumer durables and capex) and hurt long-duration asset prices. How quickly that happens will depend partially on how hawkish the Fed becomes in response to the cyclical rise in inflation and growth. It is somewhat reassuring that the evidence over the past 15 years suggests the Fed is more likely to lag than to lead the cycle. It is also worth emphasizing that, while the U.S. economy is probably strong enough to withstand a moderate tightening of financial conditions, much of the rest of the world is not. The global economy remains fragile, and a marked rise in U.S. interest rates could well destabilize it. Given the above discussion, it is natural to wonder if the next president’s policies will inaugurate a new paradigm of stronger growth, rising inflation and higher interest rates. Beyond purely cyclical effects, we are doubtful, for reasons outlined in our September note “Secular Stagnation: 2% is the New 4% for U.S. Growth.” In particular, trend growth is determined by labor force and productivity growth, with the former likely to be negatively affected by the new administration’s immigration policies. Estimating productivity is much trickier, but policies to encourage capex growth and pare back excessive regulation could boost productivity growth by a couple tenths, although the gains would probably be very slow in coming. Regardless of how all these uncertainties play out over the coming quarters, in the end it will be those companies that generate free cash flow and possess managements with competent capital allocation policies that will be the winners. * As of Monday, November 7, the betting odds on a Clinton win were 83% according to Strategas in a note sent to its clients.